I’m not going to lie. When you first start this game, it might seem a little grody. You might feel a tiny bit nauseated. But that goes away quickly, and what you’re left with is one of my favorite games of this year. It is a solid platformer first and foremost, drawing on several great inspirations, but it’s also outrageously silly and funny entirely through its world, art style, and sound effects. This is a triumphant tale of allergies, cyborg chickens, your mean Aunt Doris, and eggs. This is Eggggg – The Platform Puker ($4.99). At the center of this HURLarious (couldn’t help myself) adventure is Gilbert. Gilbert wants to go to a birthday party and his mean Aunt Doris won’t let him. He then presumably drops some mind melting drugs off-screen, because what follows is utter glorious nonsense. He gets mad, leaps out of his window, and lands in a gargantuan egg. Did I mention he has an extreme egg allergy? He soon spews himself right out of that egg, only to be met by a chicken large enough to lay such a massive egg. And here begins our auto-running fun, as you run and… well, you don’t really jump. You just kind of barf yourself off the ground by violently projectile vomiting. This kid’s noodle-y limbs don’t seem good for much I guess, but when your stomach is a pocket dimension to an endless vat of bile, whatevs. This kid puts the possessed Exorcist girl to shame. Trust me, it sounds grosser than it is. And the initial gross factor quickly wears off. This is due in large part to the colorful and whimsical art style from Spanish art duo Brosmind. The aesthetic is similar to Adventure Time/Bravest Warriors. It’s so goofy with its enemies that are basically chicken bodies or heads with robotic limbs, collectibles and environments with faces, and brightly colored barf that you’ll soon go from grossed to completely engrossed. 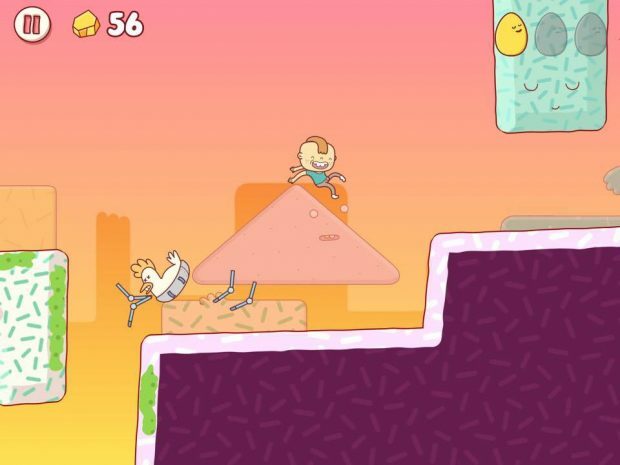 It’s no more nasty than other cartoonish App Store games like GOBTRON ($1.99) and Gesundheit! 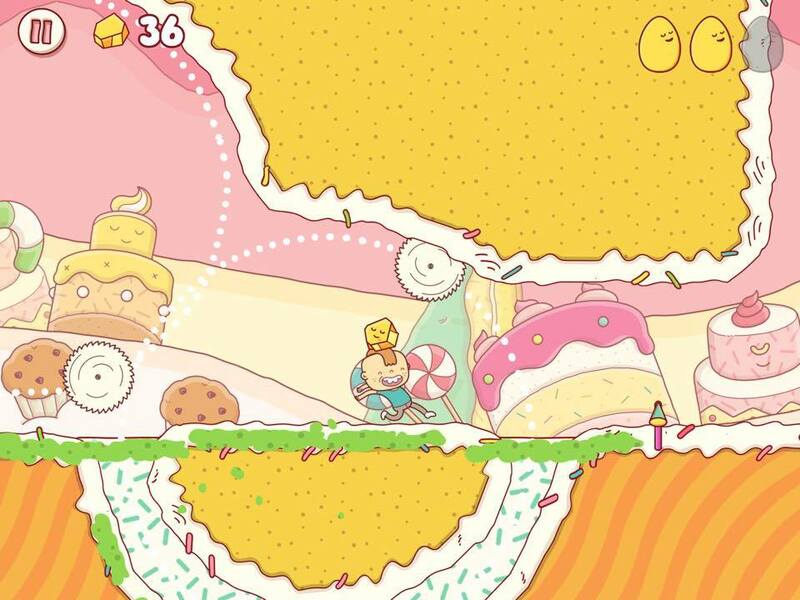 ($3.99), which also relied on humor and a vibrant palette to make their games palatable. When I first saw this game, I thought of Spewer from Edmund McMillen of Team Meat/Super Meat Boy fame. But Spewer is more of a physics puzzle platformer. This game plays more like Rayman Fiesta Run ($2.99), except that you can change directions and actually explore levels. It’s less about fast reaction times and more about placement and timing. Using a simple two touch system, you touch the side of the screen you want to run towards and touch that side again to jump. It takes a little getting used to. Especially since my initial expectation was to push the opposite side as if I was propelling myself away from my finger for some reason. But once you get it down its mostly smooth sailing. I almost expected a kind of Jetpack Joyride (Free) system with you propelling yourself endlessly upwards, but hey, maybe in a spin-off or sequel. The first two levels are hazard free to get you used to things, but by level three they throw pits and enemies at you. The game design is fast and fluid with introducing new mechanics and hazards. You’ll deal with saws, bouncy gel pads, pegs that you can hang from, the odd physics puzzle that has you using weight to open the way, switches that need to be hit in the right order, razor sharp chicken beaks and eggshells that act as spikes, platforms and pegs that move across dotted white lines a’la Mario, etc. There are even sponge blocks that you fill with spew to expand, or pools of your own vomit that you actually have to fill and swim in. Plus chickens that have deadly egg projectiles launched out of them like Kazooie from Banjo Kazooie. It gets really creative while also throwing back to platformer classics. You occasionally get power-ups by crashing into mustachioed eggs whose cries of pain makes me smile every time. You then burst out with a new hairdo and new Technicolor spew. The pink-purple vomit lets you stick to walls and ceilings indefinitely rather than sliding down. The yellow? Dear lord. I thought this kid was already violently projectile vomiting, but that was nothing. Yellow turns you into a rocket, puke into your fuel, and you literally fly around for a limited time. You’ll put your new skills to the test against a boss battle every 5 levels, with your mean Aunt Doris controlling some kind of cyborg chicken creation. The final story level, level 15, is by far one of my favorite video game levels. Period. It’s just so creative and goofy and fun. I won’t spoil anything about it. But it was worth the price of admission alone. There are only 20 levels in this game split between 15 story levels and 5 challenge levels. Now, I say only, but don’t let that fool you. The levels are pretty large and exploratory and full of hard to find secrets. I only found 6 myself. You get 3 star balloons per level by: completing it, finding all three golden eggs, and collecting at least 50 gold nuggets. I thought it was weird to be arbitrarily set at 50 instead of having you get them all, but there’s a good reason for this. The leaderboards. Not getting every egg and 50 nuggets results in a penalty to your final level time. I tried to master a couple early levels, and there’s a lot of nuance. You have to choose which nuggets to go for and which to ignore to still have 50 by the end without wasting too much time. There are also techniques like cutting corners or avoiding sliding down walls to keep your speed. Once you go into speed-running mode you can turn on the timer and a ghost of your fastest previous time. The last 5 levels are far more difficult than what precede them. 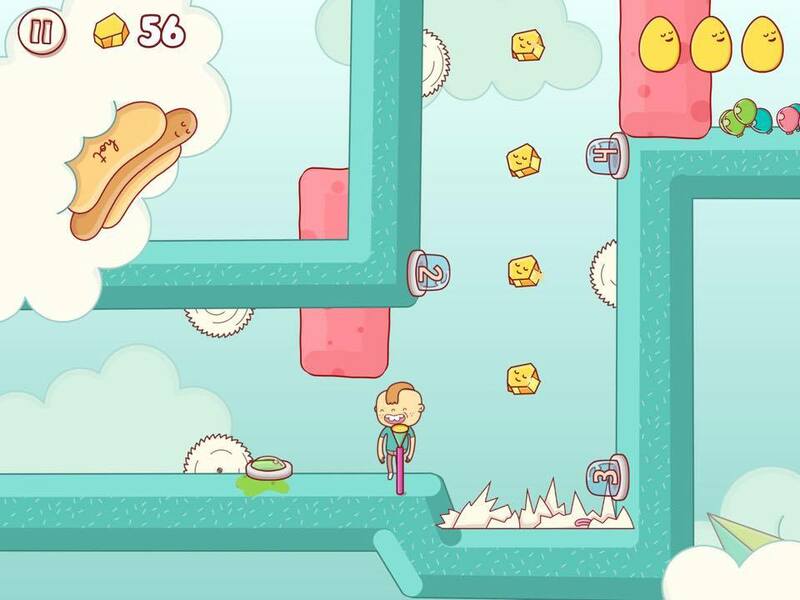 Heck, the last two levels are called ‘Rage Quit’ and ‘Super Vomit Boy’ respectively. At the time of this writing only 6 people have beaten Super Vomit Boy. Like I said, many nods to other games, but Eggggg has an identity all of its own. There’s even one level that is basically a nod to The Blocks Cometh ($0.99). I’ve never seen quite a mish mash of ideas and abject abstract weirdness, and while 20 levels may not seem like a lot, they are super high quality and can be pretty lengthy. The art is high resolution and beautiful, and there are a lot of fun details. I especially like how the random faces in the environment and platforms frown, cry, or get looks of utter horror as you vomit on them. The Norwegian developer, Hyper Games, are definitely a creative bunch. I mean, the game website is Eggg.gg for crying out loud. There you can learn all sorts of neat things, like all the strategy that went into making the perfect inoffensive puke sound, or that this game is loosely based on a movie called Gilberts Grusomme Hevn (Gilbert’s Cruel Revenge). There’s plenty of replayability with secrets, 3 starring, and speed-running levels, full Game Center support, the options to play in Spanish and Norwegian, and you can even download some iMessage stickers based on the game. An android version is dropping very soon as well. For two dollars, this is a weird and worthwhile steal.